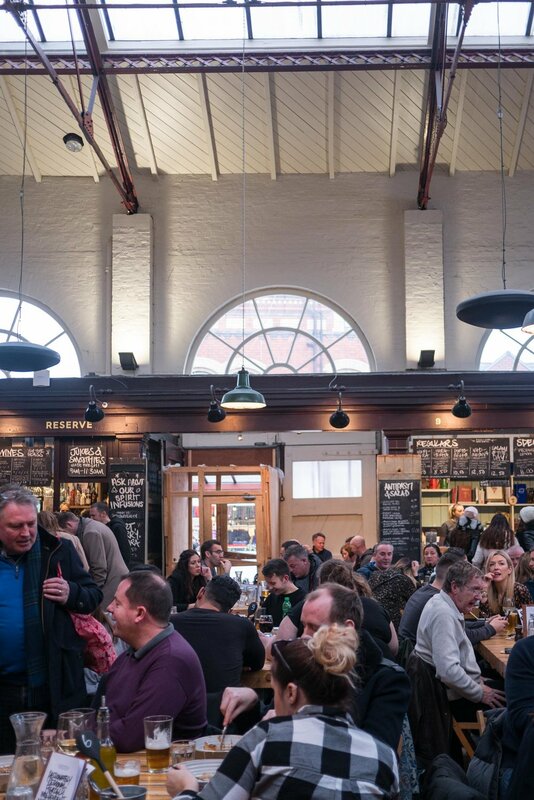 Altrincham Market has been a firm favourite in the Loaf + Pebble house for quite some time now. It's the perfect place to head for breakfast before exploring the wonderfully connected artisanal market on a Saturday morning, an excuse to escape the office and grab something for lunch & a good cup of coffee to get that brain working again and the perfect spot for cocktails and food with friends on a rare sunny Manchester day. The guys behind Alty Market are the ones also behind Mackie Mayor everyone's new favourite place in the trendy Northern Quarter, but for us you can't replace the love we have for the real OG! You'll find Altrincham Market in Altrincham's town centre standing proudly in its grand grade 2 listed old Market house. Inside you have some of the best local traders serving up everything from steaks & pizza to wine & craft beer, all housed in their stalls around the edges of the hall, whilst there's plenty of communal tables filling the centre of the hall. The idea being that you grab a table with strangers / new friends (depending on how you want to play it! ), make a note of your table number and head to whoever takes your fancy & order your food and then relax while the Altrincham Market staff hunt you down with your freshly cooked grub. Despite the fact there's numerous traders all selling what looks (and smells) like incredible food, we're guilty for always opting for Honest Crust (Manchester's best pizzas if you ask us - sourdough bases freshly baked in a wood fired oven with a super indulgent tomato sauce) or Wolfhouse Kitchen for their unbeatable Korean fried chicken burger which comes complete with Korean BBQ sauce, lettuce, pickles, chipotle mayo and crispy onions. The award winning pies from Great North Pie Co always call our name, but it's just to hard to resist the Korean fried chicken burgers and pizza, so if you've tried one give us a shout and let us know what you think! If you're heading to the market we recommend getting down early or arrive prepared to wait for a table, it's very popular with the locals so it does fill up quickly but it's worth the wait if you ask us! You can always pull up a stool to the bar tables and chill out with a cold one from the drinks corner whilst you wait for a table to come free.